I have to brag about our lettuce. It's just wonderful! Remember how Trouble and Mr.Perfect planted the seeds back in February (see Trouble in the Garden)? Well, the lettuce has arrived at the party. I wash big bunches of the lettuce and keep it in the fridge so it's always on hand. We enjoy our lettuce in everything, sandwiches, tacos and especially salads. Even Trouble loves a big bowl of lettuce with ranch salad dressing. Mr.Perfect on the other hand is more of a balsamic vinaigrette guy. Here's a very simple and easy recipe for balsamic vinaigrette. Place all of the ingredients in a jar and shake. Add to your favorite salad! How exciting to grow your own veggies! I can grow herbs, but I seem to have a black thumb with everything else. Nothing like fresh lettuce! I like your vinaigrette recipe. So nice to have your own salad greens, isn't it? I have a few growing in a pot on the deck but I can't wait until I have more growing in the ground in a garden. Your dressing sounds so yummy. How good is a blood orange balsamic vinegar?! I need to try to find some of that. Thanks! MMMM! It all looks so fresh and delicious! Thanks for the inspiration. Your lettuce looks great. My lettuce is doing well and it taste so good. Your Vinaigrette will make it even better. 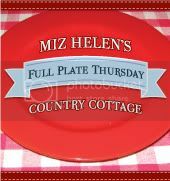 Thank you so much for sharing with Full Plate Thursday and hope to see you next week!